The long-awaited, definitive biography of The King of Soul, timed to coincide with the 50th anniversary of Redding's iconic performance at the 1967 Monterey Pop Festival. "A rich picture of [Redding’s] world….Illuminating." "A music biography with the depth to do its subject justice. Otis Redding (1941-1967) ranks high in the pantheon of 1960s musical luminaries, so it's fitting that [Otis Redding] ranks equally high among such work focusing on popular musical artists.... Better late than never, the soul master receives his considerable due in this superbly researched and written biography." "Gould vividly brings to life the man Stax Records boss Jim Stewart called 'a walking inspiration'.... From his supreme triumphs to his one last heart-breaking phone-call to Zelma, devotees and soul scholars alike could not wish for a more thorough and sensitive portrait." "Jonathan Gould’s exquisitely written biography of one of the greatest singers of all time is spell-binding. 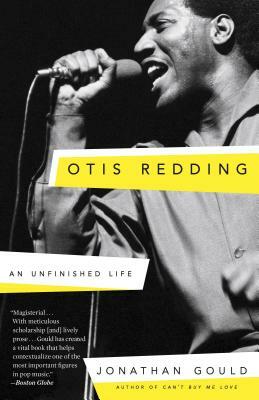 His deep research superbly contextualizes Otis Redding’s way-too-short life and career, while his incisive critique of Redding’s work makes his music come alive on the page—leaving us yearning to have experienced the remarkable performer onstage."